John Schreiner on wine: Pinot Blanc …. Seriously? When vinifera varietals were being trialed in British Columbia in the 1980s, Pinot Blanc came through with flying colours. The reliable vine was planted widely. It was, I suspect, also overcropped because a fair number of nonmemorable wines were made. I took to calling it the Holiday Inn of varietals because there were no surprises. I even discouraged Barbara Philip’s view that Pinot Blanc could become the signature varietal of the Okanagan. She persisted in her research and, in 2007, became Canada’s first female Master of Wine. Now a senior buyer with the Liquor Distribution Branch, she remains passionate about Pinot Blanc. Happily, a growing number winemakers have developed the same passion. Pinot Blanc still is a long way from becoming a signature Okanagan varietal, if only because the styles now are all over the map, but some interesting examples are being made. 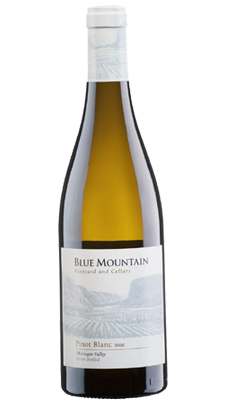 Blue Mountain Vineyard & Cellars has grown Pinot Blanc since at least the mid-1980s and has always been serious about the variety. Its current release is from the 2017 vintage and sells for $18 a bottle. I liked the wine when I tasted it this spring. The wine is crisp and focussed, with aromas and flavours of green apple and melon. There is a hint of lees on the nose as well. The wine has good weight on the palate but a tangy finish. 91. One of the earliest vintners to espouse Pinot Blanc was the late Frank Supernak after he (and partners) in 1996 took over what became Hester Creek Estate Winery. Pinot Blanc was, and still is, one of the largest blocks in the vineyard. In one or two vintages, Frank made at least three different styles of Pinot Blanc: a crisp white fermented in stainless steel, a fuller wine aged in oak and a big barrel-fermented Pinot Blanc that tasted a lot like Chardonnay. It showed the versatility of Pinot Blanc but it was commercial folly. Consumers had a difficult time remembering which style they preferred. Hester Creek, blessed with one of the oldest plantings in the Okanagan, still produces Pinot Blanc. It is fermented cool in stainless steel. I have always found the crisply refreshing style immensely appealing and I rate the current vintage at 92..
Two other exponents of this style are Lake Breeze Vineyards and Nk’Mip Cellars, with a pair of 91 point wines. Both have access to mature vines which deliver grapes with lots of flavour. Both wineries ferment and age the wine in stainless steel, preserving crispness and freshness. Other exponents of differing Pinot Blanc styles have emerged recently from winemakers pushing – as Frank Supernak did – the limits of the varietal. JoieFarm owner and winemaker Heidi Noble released a Pinot Blanc this fall under her Chic Fille label (the label she has developed for her more experimental wines). Heidi has often treated Pinot Blanc like Chardonnay, giving the wine lots of lees contact “to make it texturally more lush and mouth-filling on the palate.” She has fermented the wine in oak. “In 2009, I had the opportunity to start working with Pinot Blanc from a 30-year-old site in the Mission of Kelowna,” Heidi writes. “Working with older Pinot Blanc that had started regulating its own low yield produced a magnificently aromatic and honeyed Pinot Blanc which was unexpected.” In 2013, she released a single varietal Pinot Blanc. Her exploration of the variety also took her in 2007 to fermenting Pinot Blanc on the skins to see how that would affect the flavour of the wine. “Not a huge success organoleptically, but very interesting nonetheless,” she writes. However, all her experience with Pinot Blanc led to the making two barrels of the 2017 Chic Fille, which sells for $34.90. In this wine she re-explored on-skin fermentation. The method was quite complex. Half the grapes were destemmed and whole berries were placed in an open-top bin fermenter. The berries started fermenting spontaneously. When they began to pop, they were crushed by foot and continued to ferment on skins until just over half the sugar was gone. They were then pressed, with the must finishing fermentation in stainless steel. The wine was then racked in a neutral barrel where it went through spontaneous malolactic fermentation. The free run juice pressed from the other half of the grapes was racked to a neutral barrel where it fermented naturally. The wine was then racked off the fermentation lees but returned to the same barrel for spontaneous malolactic fermentation. Both barrels were aged over winter, combined in stainless steel in late spring and bottled a month later. As you might imagine, the Chic Fille Pinot Blanc presents a taste profile considerably different from, say, Hester Creek. The wine has a full texture with aromas and flavours of apple and citrus. The style will appeal to those who appreciate “natural” wines. 90. Anthony Buchanan, the chief winemaker at Desert Hills Winery, specializes in Pinot Blanc (and Pinot Noir) under his own label, Anthony Buchanan Wines. Earlier in his career, he worked at Blue Mountain Vineyards and Cellars. For his 2017 Pinot Blanc, which sells for $20 a bottle, he obtained organically farmed grapes from a vineyard planted in 2002 on the Black Sage Gravelbar. Whole cluster berries were pressed in neutral oak barrels (70%) and concrete (30%) and allowed to ferment with wild yeast. The wine was aged 5 ½ months in a combination of a second-fill French puncheon, neutral French oak barrels and concrete barrels, with lees stirring every two weeks. “Simple but sensible winemaking,” Anthony writes in his technical notes on the wine. The style leans more to the crisp, refreshing expression of Pinot Blanc, with aromas and flavours of apple and pear mingled with a touch of brioche and a spine of minerality. 91. Keep an eye out for an emerging winery called Rigour & Whimsy. I happened to meet owner/winemaker Costa Gavaris this fall at another Okanagan Falls winery. He gave me a bottle of his 2016 Pinot Blanc, which was fermented on the skins for two months and aged in barrel for 15 months. The back label offers no more detail but I suspect the wine was fermented with wild yeast as well. Light gold in colour, the wine is intensely fruity, with flavours of apple, quince and pear. The texture is rich and the finish is quite long. 91. “Our plans include building a land-based winery at 4112 McLean Creek Rd,” Costa told me in an email this fall. “Currently we have planted approximately 3.5 acres of the 5 acres we own. This is half and half Gamay and Chenin. The unplanted areas are for winery and home (eventually). We hope to begin build on the winery in the next 2-3 years. I am not sure where to find Rigour & Whimsy’s wine at this time, but the winery has a nascent website, giving consumers an opportunity to sign up. On the strength of this wine, I recommend signing up.